More officially called “hill 409”, Roberts Roost is a single eyrie just south of the Westwood Ridges. It's dozens of meters higher than the ridges, and offers spectacular views in all directions. 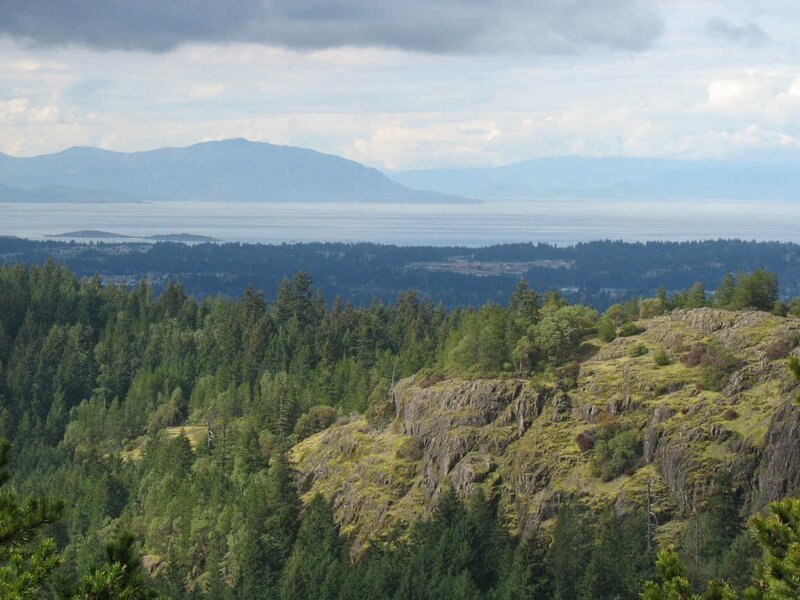 This photo shows the view FROM the Roost, looking north-northwest over nearby Westwood Ridge, across North Nanaimo to the Winchelsea Islands and Lasqueti/Texada Islands. Really - if you're going to go to all the effort to find a way to the top of this lookout - you have to plan ahead, and spend some time up there. It's the kind of spot you don't want to leave until you've filled yourself with it. On the side of the Roost closest to Mt Benson, check out the glacial striations in the bedrock! This is evidence of the km-thick layer of ice that "recently" scraped along here, destroying absolutely everything. A lot of the land surrounding the Roost belongs to the Department of National Defense, and entry to those areas is forbidden. I can't advise about which routes might be authorized, if any.